Introduction: While historically existing animals and literary animal characters inform allegorical and metaphorical characterization in The Canterbury Tales, figurative usage does not erase recognition of the material animal. “The Pardoner’s Tale,” for one, challenges the terms of conventional animal metaphors by refocusing attention on common animals as common animals and common human creatures as something worse than vermin. Most attention has been paid to the larger animals-goat, hare, and horse-that constitute the physical portrait of Chaucer’s Pardoner in the “General Prologue” and in the prologue to his tale. Like these animals, rats and a polecat, together with rhetorical shrews, appear in this tale as well as in other literature, including bestiaries and natural histories. Equally to the purpose, these animals could be physically observed as constituents of both urban and rural landscapes in fourteenth-century England. In the Middle Ages, animals were part of the environment as well as part of the culture: they lived inside as well as outside the city gates, priory walls, and even domestic spaces; a rat in the street or the garden might not be any less welcome or uncommon than encountering someone’s horses and goats nibbling vegetation or blocking a passage. Not being out of the ordinary, though, such animals could (and can) be overlooked or dismissed as common, too familiar to register. This chapter reveals why readers and listeners should pay close attention to the things they think they know and what they hear about what they think they know. When the Wife of Bath alludes to an Aesopian fable, she reminds us of the importance of being aware of who is responsible for representing characters in a particular way. In the tale, her rhetorical question, “Who peyntede the leon, tel me who?,” is intended to draw attention to how women have been represented in the antifeminist tradition; the of the question partly resides in that in the fable a lion is the one challenging a man’s assertion of human superiority based on a statue of a strangled lion. Still, even in Aesop’s fable, when the lion speaks, it is a human author who has put words in its mouth. 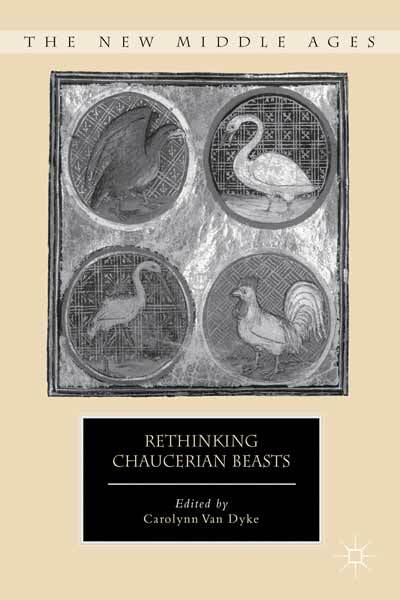 Chaucer scholars have lately become interested in the implications of Chaucer’s use of animal discourse. Lesley Kordecki, for one, has looked at how nonhuman discourse in “The Squire’s Tale” leads to “consideration of subjectivity and, conversely [how] the possibility of animal discourse challenges the very foundation of subjective authority, authenticity and privilege. In other words, talking animals make Chaucer reflect upon his own hegemonic ownership of words.”s This is also one response to the Wife of Bath’s question regarding subjectivity and authorship. But in “The Pardoner’s Tale,” animals that are physically rendered and represented as animals don’t talk. The Pardoner does: he insists on his authority, displays his command of language, and is represented as paint himself in his prologue and tale. He reveals his rhetorical intentions and his methods, admitting to having a single focus in his “prech(ing],” that of”coveitise” (VI.423-34). To this intent, he puts words in the mouths of his characters who serve his “moral tale” that greed is the root of all evil (VI.460, 426). Among the characters that he creates are those he calls “shrews” or “cursed rioters,” one of whom he represents as inventing a story to accomplish his own greedy purpose-to kill his companions and keep all the treasure for himself In that story, both the human “shrew” and his own inventor exploit assumptions about two other familiar, common animals: rats and a polecat.